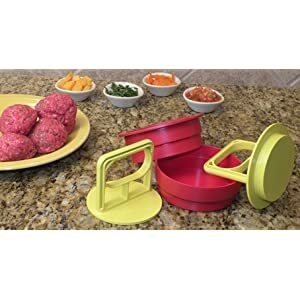 -- The Burger Pocket Press is a stuffed burger maker. The Burger Pocket Press has a unique concept in which you are able to apply your condiments between the meat thus encapsulating your favorite condiments. Your pocket patties then can be cooked right away or stored in the refrigerator for a few days or even freeze them for later use. Michelle Lane posted: My father in law has used his for years!!! I want one! Brandy Kinghorn posted: I think it would actually take me longer to use this than to stuff them by hand the way I've been doing for years... Waste of money! Vote below - Good idea - or - Waste of Money?